Find hotel near Museo De La Muralla Punic .. The Museo de la Muralla Punica contains the remains of the original wall that encircled the city during the period before the Romans occupied Cartagena. The remains of the wall date back to the 3rd century BC. The remains are about 30 metres long. An informative video is played at the museum where visitors are introduced to the rich history of Cartagena. 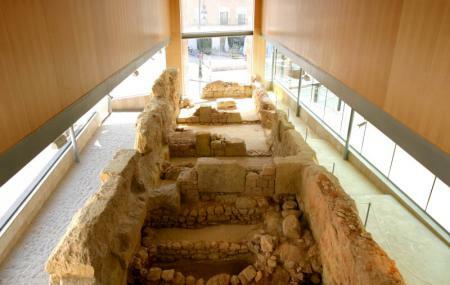 Also at the museum are the remains of the crypt belonging to the hermitage of Saint Joseph. The timings are subject to change. Please contact office before visiting. Adults: €3.50 , Free entrance for kids under 3. If you book online, Children (3-12), Students and seniors with ID, Disabled: €2.50 . How popular is Museo De La Muralla Punica? People normally club together Augusteum Roman Museum and Cartagena Cathedral while planning their visit to Museo De La Muralla Punica. This is a pretty small museum and for me wasn't worth the €3.50 admission because I didn't really learn anything new. My girlfriend did think it was worth it though. The wall isn't that impressive at all. They have a short movie about how the city of Cartagena was created which was fun to watch. This site was 3.50 euro each and was probably worth the admission. The museum and sites are fairly small. However, there was a great video portion that was quite informative. It was nice to see part of the Punic wall and an old burial site as well from Roman times with a spooky depiction of the 'death' God. Not a huge amount to see but I spent half an hour reading the displays about local history. Good place to learn Carthagian history. Gladiator exhibit is interesting!